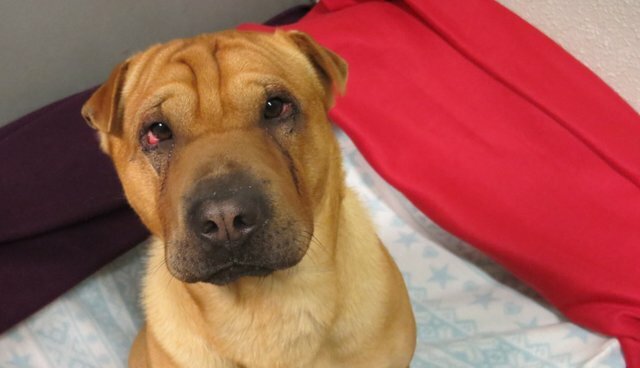 An adorable shar-pei mix named Kai who was found cruelly abandoned at a railway station in Scotland earlier this month is one step closer to a happier life. After word of Kai's sad story spread, it led to an outpouring of support and "phones ringing off the hook" at the Scottish SPCA with offers to adopt him. Before the jilted canine could be welcomed into a loving new home, however, there was one medical issue that needed to be addressed to make the years ahead more comfortable for him. "Kai was suffering from inversion of the eyelids, meaning his eyelashes were rubbing against the surface of his eyes and causing him pain and discomfort," Alan Grant from the SPCA told the Scottish Daily Record. "This is a fairly common condition among shar-peis." The surgery wouldn't come cheap, but fortunately Kai had gained quite a few friends who were willing to help. After the SPCA set up a donation page on his behalf, strangers from around the globe pitched in nearly $9,000 in just a matter of days - and it paid off. "Kai underwent an operation on his eyes on Friday and we are pleased to say it went really well!" writes the SPCA on Facebook. "Here's a new photo of this very brave boy, who is now recovering and getting plenty of TLC." As Kai looks forward to the brighter future that every dog deserves, his case is helping to highlight a problem that exists in the modern pet trade. He was apparently abandoned after a botched sale online - one that put money ahead of his well-being. Once Kai has fully recovered from the surgery, the SPCA plans to adopt him into a forever home.